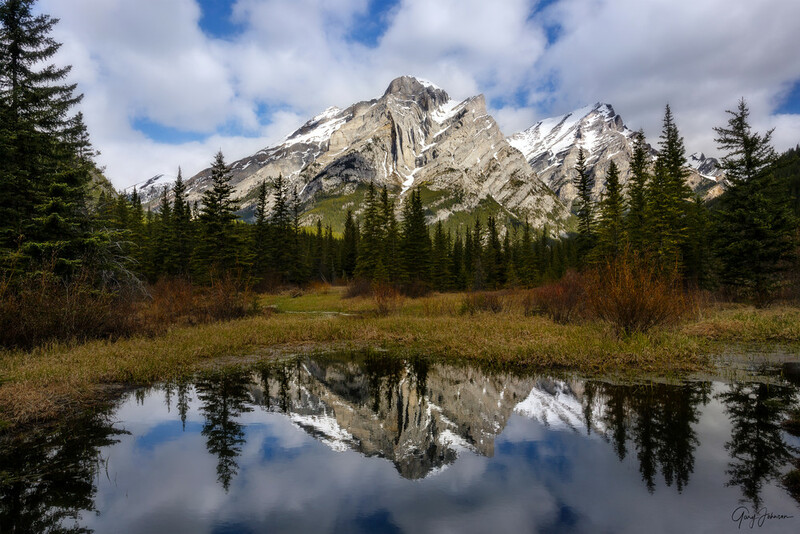 I photographed this beautiful reflection of Mount Kidd during my second photographic trip to Canada. Mount Kidd is located in Alberta, Canada in the Kananaskis Country on Highway 40 west of Calgary. I loved the calm pool giving me this incredible glassy reflection. I returned to this spot three different times to see Mount Kidd with different cloud cover. As I was photographing this mountain, big horn sheep were walking and grazing down the steep hill on the opposite side of the highway. There were also fresh bear tracks near the river letting me know that I was in their territory. Guarantee and Return Policy Guarantees If you don't love it, return it. Read on for details regarding our 100% satisfaction guarantee, and for instructions on how to make a return. Return Policy We are committed to quality products and your satisfaction is 100% guaranteed. If for any reason you are not completely satisfied with your purchase, you may return it within 30 days of receipt and receive a free replacement. No shipping charges will not be refunded. How To Return your product: Choose from two ways to return: Damaged Returns: If your product arrives damaged or defective in some way we offer a hassle-free Photo Return process to speed replacement. Here's how: 1. Take a digital photo of your damaged product and the shipping container it arrived in (only if the package is also damaged). 2. Attach your photos to an email and send them to gjphoto@comcast.net Please include your order number, shipping ID or item number, a brief description of the reason for the return. 3. You will receive an email within 24-48 hours confirming that your photo return is being processed. 4. If your photo return is confirmed, you do not need to mail back your product. We will process the replacement based on your photos. 5. Please note: If the damage or quality issue is not apparent in the photo, you may be required to return the item at your expense before the return can be processed. Regular Returns: You may return your product for a full credit of the product cost (excluding shipping charges) by following these simple steps: 1. Email me at gjphoto@comcast.net to obtain the return instructions for your order. 2. After you hear back from me ship your item back to us in its original packaging and enclose your completed return request. We strongly encourage you to return the item via a trackable method. Uniquely durable print with vibrant colors, brilliant luminescent images, and exceptional detail. MetalPrints™ represent a new art medium for preserving photos by infusing dyes directly into specially coated aluminum sheets. Because the image is infused into the surface and not on it, your images will take on an almost magical luminescence. The ultra-hard scratch-resistant surface is waterproof/weatherproof and can be cleaned easily – just avoid direct sunlight. Acrylic Prints are beautiful photo prints face-mounted to plexiglass with polished edges. Offered with a variety of ultra-modern mounting options. © Copyright 2018, Gary Johnson Photography All Rights Reserved. Welcome to the Gary Johnson Photography "Landscape Art" Newsletter sign-up sheet. By signing up for my Newsletter you have access to my stories about my images, education about photography topics, and notifications about drawings and sales. By entering the coupon code save20%, during check out, you will receive a 20% discount on your first purchase.